Join KCASA with Legal Counsel Lee Brumitt; Dysart Taylor for a Legal Workshop breakfast. Designed to assist and educate our subcontractors on contract language and answer your specific questions. Space is limited so please sign up TODAY! Save $25 if you sign up for all four classes. Join KCASA for our biggest party of the year! KCASA Meeting of the Membership. Join KCASA for our annual Meeting of the Membership designed specifically for members only of KCASA. RSVP HERE - remember, this meeting is for members of the association only!. 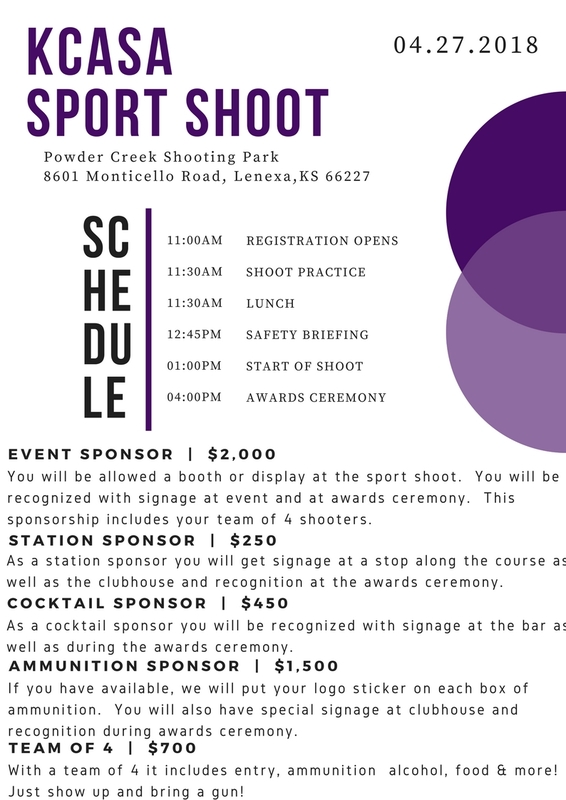 Join KCASA for our annual Sport Shoot at Powder Creek Shooting Park. Join KCASA for our monthly meeting happy hour with Built Interior Construction and tour their “Green Learning Center” to learn more about Interior Pre-Manufacturing Structures. Join KCASA for our monthly meeting with an education discussion on Silica presented by KCASA member and OSHA Compliant Safety Dave with Progressive Environmental and Safety Consultants. Sponsored by Centric, hosted at their new downtown location! Join KCASA for our monthly meeting sponsored by Crossland Construction. Join KCASA for a special Lending Q&A with CommunityAmerica Credit Union. Join KCASA for our holiday Mingle & Jingle at Kaw Valley Companies sponsored in part by Turner Construction Companies. This is a free event, however, we do ask that you bring a toy for donation to Children’s Mercy Hospitals. Please let us know your coming, and register here! Join KCASA for our monthly meeting. Meet us at Monarch.Build office for a light dinner, beer and informative presentation from Northpoint Development designed specifically for subcontractors to help you and your business grow and excel as leaders in the Kansas City Construction Community. Join us as a team of golfers or with a sponsorship! Join KCASA with McCownGordon Construction as we discuss ACH Fraud and how it can affect your business. Meet us at Calibration Brewery for a light dinner, craft beer and informative topics to help you and your business grow and excel as leaders in the Kansas City Construction Community. Join KCASA with sponsor KADEAN Construction as we present on Surety and so much more with The Miller Group. Join KCASA for our Monthly Meeting as we discuss Drones with a special presentation from Laser Specialist. Join us at Kaw Valley Companies Sand Plant at 9501 Woodend Road in Edwardsville, KS for a 3D measurement and demo of their sand pits. Join us for this fun and informative presentation, and a few beverages as well! Join KCASA for our Monthly Meeting as we discuss HR & Background with special guest speaker.